The Nintendo 64 was another great console that had many great games, and you can relive many of the gaming experiences of the N64 by getting an emulator for Mac OS X. 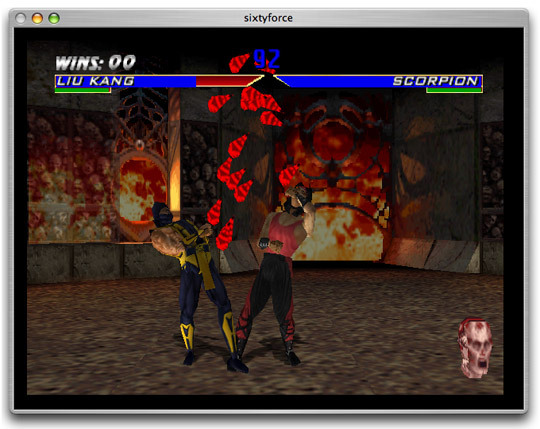 The N64 Emulator I use in Mac OS X is called SixtyForce, it opens and plays N64 ROM’s quite well and allows you to run the games at full screen or in windowed mode, customize your controls to use either a keyboard or USB gamepad, and more. Sound good, and you’re a fan of Nintendo 64? Then check it out yourself. You can download SixtyForce for free at sixtyforce.com but you’ll have to get game ROM files elsewhere. SixtyForce isn’t as full featured as some of the other emulators out there in the Windows world, but as far as I know it’s the best option for emulating the Nintendo 64 console natively in Mac OS X.
SixtyForce works best with an external controller, though keyboard support is included it’s just not as a good of an experience for gaming, but you probably already guessed that. Using a USB or Bluetooth controller works well enough, just be sure it has enough button options and configure it in the settings to work with 64orce. PS2 Emulator for Mac – PCSX2 is the best PS2 emulator for Mac OS X that I’ve seen so far, it’s not perfect but it works. Nintendo DS Emulator – Play Nintendo DS games in Mac OS X. Biggest downside is that it doesn’t support full-screen mode (yet at least). SNES Emulator for Mac OS – SNES is my favorite console of all time, and SNES9x is arguably the best emulator for Mac OS X ever. There are others out there as well, be sure to let us know in the comments if you have a favorite emulator or console that runs particularly well in OS X.
OoT was a sweet game, but I can’t handle consoles with a keyboard. USB Gamepad is the way to go. Check out ‘Genesis Plus’ and get the ‘Emulator Enhancer’ plugin for fullscreen mode and a few other add ons..
Plug in a wired 360 controller. Very Cool I have been looking for a 64 emulator for macs, how well does it work? Eager to give it a try. http://www.RomVillage.com – Retro Rom Site – Unlimited Speeds! Best Megadrive emulator for Mac is Kega Fusion. Plays Master System, Game Gear, Sega CD and 32X titles too. Best controller by far for playing all of these games is the PS3’s (Bluetooth) joypad. Kega Fusion is amazing. Owns the hell out of Genesis Plus. Zelda OOT wont work for me cant even go past the profile selection. Sixtyforce just crashes does anyone have a good OOT ROM that actually works? The problem isn’t with the rom, it’s the developer. It seems this guy wants you to pay 16 bucks so you can have all the options of this piece-of-crap we’re calling an emulator. It doesn’t work on most of the games I’ve tried, and when it does run (not counting the random freezes) it’ll screw up something else like not showing the graphics, or showing eff’d up polygons. Oh, you went into a shop in Zelda? Well too bad, I’m not showing you what’s in the shop… The only reason to get this emulator is because it’s the only one (I know of) on the mac that you can use a controller with… A pathetic, glitchy POS that needs to be replaced with a better model. 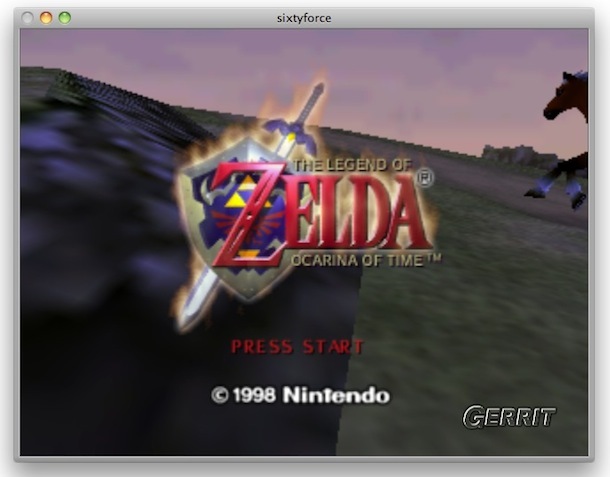 Just want to say that I’ve had good experiences with SixtyForce for many years, and in fact it’s the only N64 emulator for the Mac that I’ve been able to run the ZELOOTMA rom in. I just downloaded sixtyforce a few days ago. I’ve been able to play OOT pretty well but MM not as much. It just pisses me off that you have to pay just to save the damn game. I might try to get a windows and use Project 64 like the rest of the world. Its pretty good for Super Smash Bros. though, seeing as you don’t really need to save except to use the unlockable characters. By the way, does anyone know a good emulator/rom website besides coolrom.com. Everywhere else I’ve tried just gives out bogus downloads that don’t work. What kind of jerk tries to make money off of an emulator? The emulator is pirated from the hardware, and the games are pirated software. I have no problem with free pirating, but charging money for it is wrong and defeats the whole purpose. I am using the emulator in OS X Lion right now, what are you talking about? This guy has spent literally hundreds and hundreds of hours of unpaid time to create the only decent working Mac N64 emulator that supported the many games. He kept it working over the years throughout all the OSX system changes since the early 2000’s and it still works today. I imagine that he only probably had a handful of people register the app so at best it paid for a few hot meals – not exactly making him rich. So a small fee to activate a few extra features isn’t the earth to pay to a poor developer. Don’t believe me, well try writing your own app and see how much money it actually makes you. Have a bit of respect for indie developers!